Affiliation between interacting partners is associated with a high level of behavioural synchronization in many species. Pet dogs are known to share strong affiliative bonds with their owners and to synchronize their behaviour with them when moving freely indoors. Surprisingly, outdoor dog–human interspecific synchronization has seldom been investigated. We therefore explored whether, when allowed to move freely in a familiar outdoor space, dogs synchronize their behaviour with their owners’ movements. We found that dogs visibly synchronized both their location (staying in close proximity) and their activity (moving when their owner moved, and at the same pace, and standing still when their owner stood still) with those of their owners. 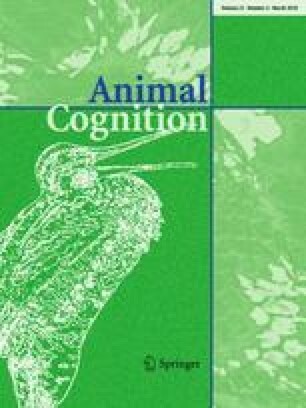 By demonstrating that owners act as attractors for their dogs in an outdoor space, the present study contributes new data to the understanding of interspecific behavioural synchronization. The online version of this article ( https://doi.org/10.1007/s10071-017-1155-x) contains supplementary material, which is available to authorized users. The authors are grateful to Cecile Betremieux for the reliability coding. We also thank the owners who volunteered for the study. This work was funded by the National Association for Research and Technology, the Aide aux Vieux Animaux (AVA) association, the National Centre for Scientific Research, and Aix-Marseille University. Data are available on Open Science Framework at the following address: https://osf.io/fvwam/?view_only=26d195c0dff24f29bc811671aba4b218. As the present study was only observational, all applicable international, national, and/or institutional guidelines for the care and use of animals were followed. Also, all procedures were in accordance with the ethical standards of the institutional and/or national research committee and with the 1964 Helsinki Declaration and its later amendments or comparable ethical standards. All dogs owners signed an informed consent before participating in the study.